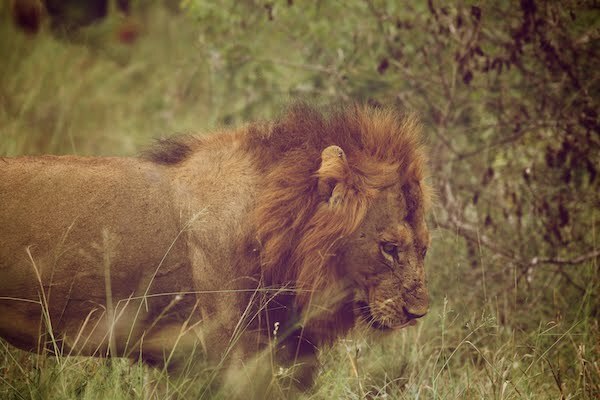 Undeniably, the most exciting animals to see at Kruger National Park are the lions. 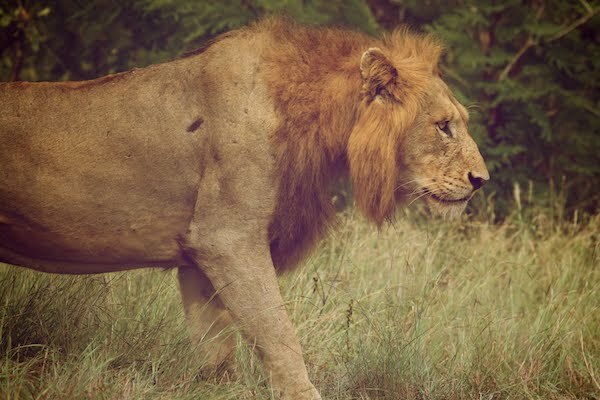 Pretty much all the animals in Kruger can be seen in zoos around the world, but there's something incredibly thrilling about seeing a massive lion in the wild. We went 3 days in a row without seeing any, and were starting to worry we wouldn't spot any at all. 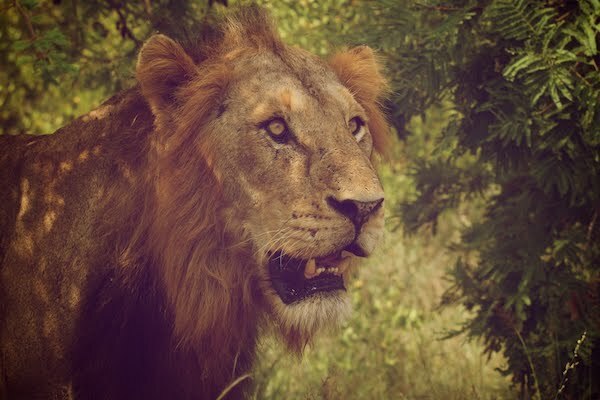 We were still grateful to see the other wildlife, but it was annoying to know that the lions were in the park, and that we hadn't seen them. On the 4th morning, we left the gates of our base-camp at the crack of dawn. After about 10 minutes of driving we noticed an animal walking along the side of the road ahead of us. The shape, and the way it was walking, made it evident to both of us that our luck had turned. With the sun still lingering on the horizon, we captured a few disappointing photos but were in shock and awe of the beast that had strolled within inches of our vehicle. The next day we headed off in the morning to leave the park. With the drive back to Johannesburg ahead of us, we knew we could hang around the park until noon, before we would need to leave for good. Just before lunch we rounded a bend and found several cars stopped on the road. 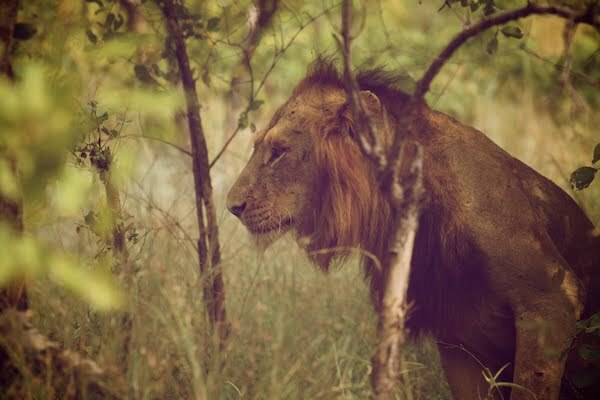 We approached and noticed that a group of lions were relaxing under trees. As we watched, they walked across the road, between cars, sat affectionately with each other, nibbled on grass, and slept. These guys were significantly larger than our "friend" from the previous day. The behaviour of these cats was remarkably similar to that of the domestic variety; they couldn't have cared less that we were around. We were so close that we could actually hear them "purring", but it was more of a deep rumbling noise. It might have been somewhat frightening if they weren't so lethargic. 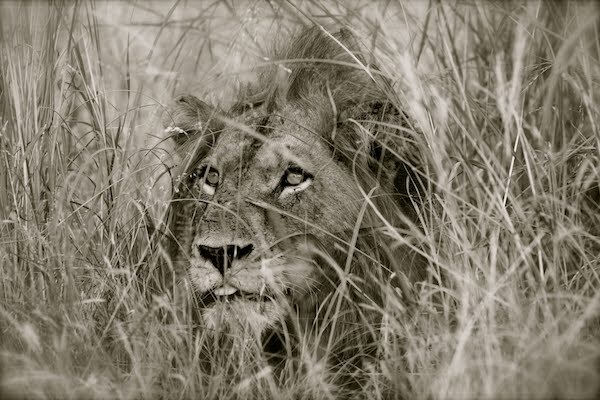 This is our final post in our "Big Five" series - charging elephants, hidden leopards, unpredictable water buffalos, endangered rhinoceroses, and the majestic lion - we feel incredibly fortunate to have seen them all in their natural environment. 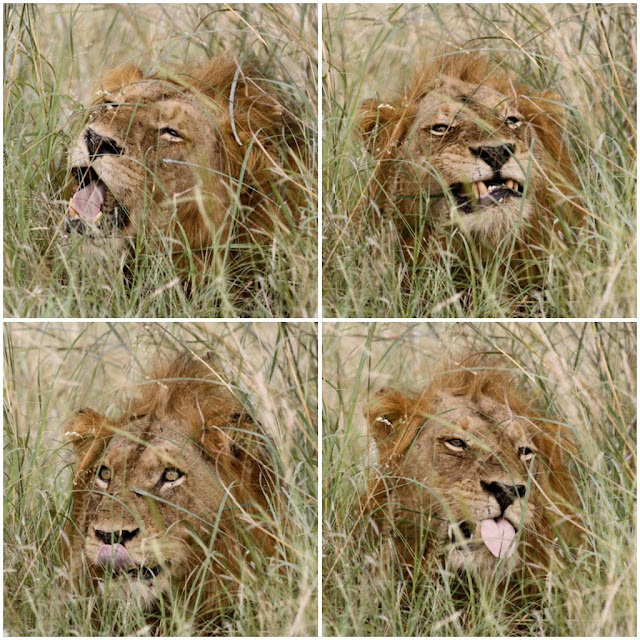 these are beautiful photos..i almost think i can feel the lions heavy breath on the first one ! i love the pic of mina shooting that pic too! you two have chosen a wonderful way to live life! okay, now THAT would be cool! OMg They are huge! Great pix guys! I can't believe you got so close! those photos are EPIC. 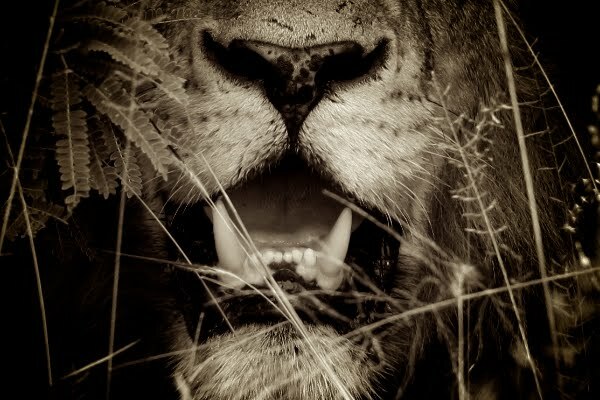 lions are gorgeous... fascinating... wow. incredibly fortunate you are. 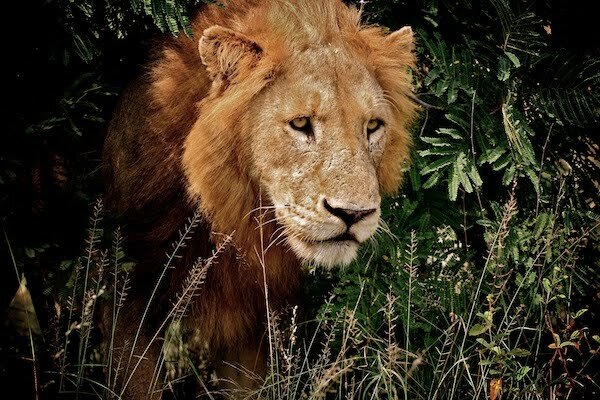 just when I thought the animals couldn't get anymore intense, you find the lion. Interesting how lethargic they were. I guess thats the difference between "cats" and giants beasts like the rhino. The second to last picture is brilliant and terrifying, for some reason. WOAH! these are so crazy! that's awesome. these pictures are incredible! i love living vicariously through you guys. wow great experience, makes me really excited for my safari in 2 months!! Wow! Just read your bio! Can't wait to follow along...this is so cool! I loved how the lions came right past the car. So majestic! 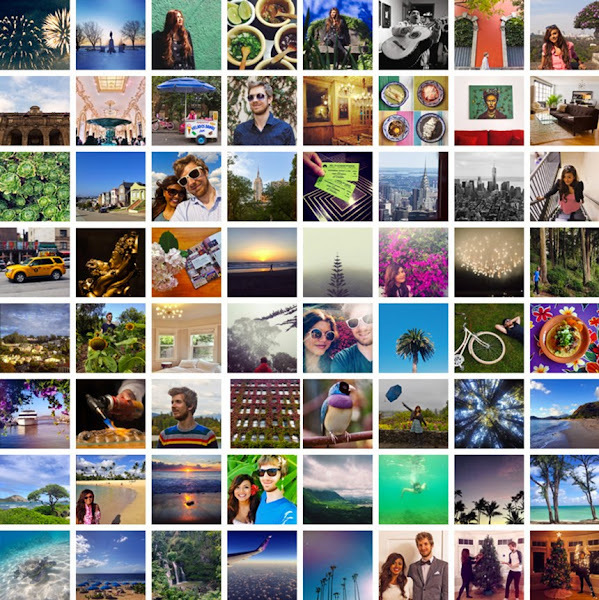 I loved all the posts and pictures from your safari. I've always wanted to go, and this just adds more fuel to the fire! Love the first picture (and the shot of Mina taking it, too). Wow, great photos! Those are some scary too close for comfort type of images! Alas, I would love to go to Africa someday. Just need to convince the hubby. OMG ! THIS IS NUTS! we definitely dont see that every day in california! so cool! these photos are absolutely gorgeous! that first one takes my breath away. oh my i love your blog!! these pictures are amazing! 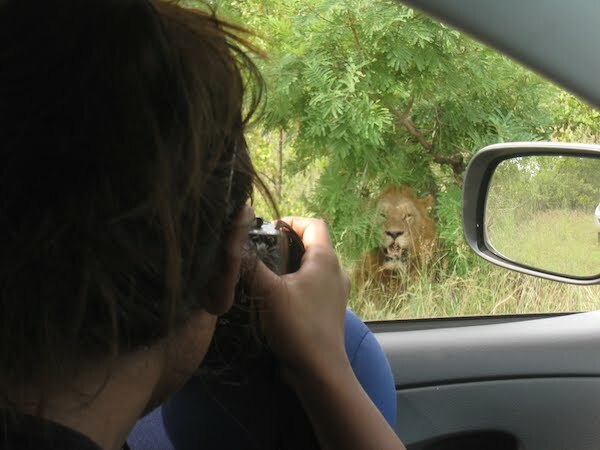 I cant believe you were that close to a Lion! my husband is obsessed and wants to go on a safari!! !